Start off a new year of reading discoveries with substantial excerpts from 44 Buzz Books due to be published in the months ahead. At the end of most excerpts, you will find a link to the full galley on NetGalley! For still more great previews, check out our separate Buzz Books 2019: Young Adult Spring/Summer. For complete download links, lists and more, visit buzz.publishersmarketplace.com. A fantastic way of taking a look at what’s new for the spring and summer . I always enjoy these  as it’s a great way to make choices with being able to read excerpts, while I have some of the galleys, it was good to see the ones I missed. I also appreciate being able to request a title at the end of the excerpt. Thanks so much for makthexs available. Once again Buzz Books is back with its first issue of 2019! I love being able to read excerpts from upcoming releases. 2019 is shaping up to be a big year for books! Thank you for sharing! I am excited about the newest Buzz Books! These collections of excerpts are such a great tool for me when planning which books to add to my tbr and feature on my blog. Some of the books featured in this collection were already on my radar such as The Guest Book, Little Darlings, and How Not to Die Alone. I am also now looking at several additional books such as The Girl He Used to Know. It looks like there are some great books hitting the shelves soon. Do not read this or any of the excerpts of so many exciting new titles due imminently for publication if you do not want to add as many as I have to my ‘to read’ list. Some titles previously bypassed by me have been given a second glance and now been added to my reading pile.. Such an excellent little publication to help booksellers and book lovers to  decide what fantastic books are out there on the radar. Buzz Books 2019: Spring/Summer has tons of wonderful excerpts to discover new books and authors. I especially enjoyed the debut section! Wonderful selections! I was already looking forward to Little Darlings and The Long Flight Home but now I have several more books to add to my TBR! Love the wonderful suggestions from this NetGalley publication. I wish there were more of them. Love adding to my tbr. I'm not gonna lie, I've been wondering where the latest Buzz Books was hiding. It feels like eons since the last one came out, and I was starting to worry that there would be no more. But worry no more, the latest Buzz Books is here and it is huge. HUGE. So full of goodies, it feels like Christmas. There were several books that I requested because of the excerpts and even more that I put on lists because...no request link. :( That would be my singular complaint. It felt like there were quite a few that aren't currently requestable. But, I imagine they will be eventually, and now I know to keep my eye out. As always, I consider Buzz Books a fantastic tool to help carve out my reading plans for the upcoming months. Hopefully the next issue won't be so far off! Ahh, welcome back Buzz Books! I really missed these issues over the winter period and wondered where they'd gone, so I'm happy they're back with a bang. Once again there is a strong selection of books here, and the excerpts certainly whet your appetite. You can never have too many books in your TBR pile so pick this up for guaranteed additions to your already wildly out of control mountain in the corner! Many thanks to Publishers Lunch/Buzz Books for my copy. Excerpts from fiction, fiction debut, and nonfiction titles for books coming out through the Spring/early, early part of Summer 2019. Lots of great titles to look forward to! 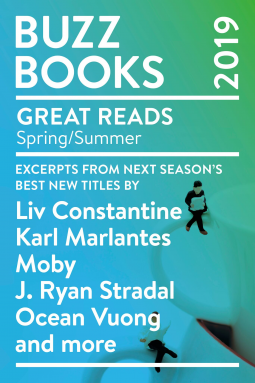 Another great selection of excerpts in this Spring/Summer Buzz Books 2019. There are so many that i hope to read in due course and i would, if i had my way, read the majority of them. The books that i would love to add to my shelf would be 'The Guest Book, The Last Time I saw You, A Nearly Normal Family, The Snakes, Deep River The Confessions of Frannie Langton  and The Long Flight Home. There are others that i would also love to read, but all depends on whether i could squeeze another few books on to my ever growing pile of books. Oh my goodness! There are so many awesome books coming out this year! It's very hard not to hit the request link at the end of each snippet! Okay so I did request a few and wrote quite a few down to look for later on! This is a great way to get exposed to books you normally wouldn't read. This way you get a taste of the way the author writes and if you like it or not. I always look forward to this. Thanks for the excerpts and links, as well as the lists of upcoming books! Great way to find out books that are upcoming! I found out a ton of awesome books that I will now be on the lookout for! Thanks for this wonderful tool, allowing us to know about the books coming out for Spring/Sumer 2019. Love buzz books always look forward to all the carefully chosen selections my wish list grows and grows.#netgalley #publisherslunch. I’ve been anxiously awaiting this so I was so happy to see it available. A fantastic resource for book nerds. I love that we’re given so much information on upcoming releases. My TBR just grew again and I’m not mad about it. Highly recommend for those looking to see what’s coming. I especially love all the fantastic debuts coming. Another great sampler of upcoming titles. I look forward to reading through these samples, and hopefully finding whole e-galleys of some on the site! Thanks. This was great as usual! Lots of good books coming up. I requested many, especially fiction. Always look forward to checking out the buzz books. Don't stop - I look forward to an exciting 2019 in literature! Thanks, NetGalley and Buzz Books 2019 for the Spring/Summer book. Wow, great idea. Looking forward to many of this. Love being able to see the excerpts from the books also. A new list is always a great thing. THANK YOU Publishers Lunch. Great selection of previews in this season’s catalog! I found a few that I knew I wanted to read and a few that I thought I didn’t want to read until I started reading the preview! Thanks for adding some interesting selections to my TBR yet again! I always look forward to this list because it gives you amazing recommendations at a glance. It also gets you excited about the new and upcoming anticipated reads. With this list, I can plug in the dates into my planner, so I don't miss release dates. Wonderfully helpful, as usual, in providing a sense of upcoming publications worthy of ‘buzz.’  There’s a new organization and look to this edition and it is quite nice. Regardless of how closely I track publishers information, Buzz Books really provide the inside track. I remain a huge fan. Another Book Buzz with a great collection of upcoming books! This issue listed several ARC’s that I have (waiting TBR), several more I’ve added to my TBR list and one that I was sadly declined for. I’d love to see more book covers and excerpts! Mesmerized by the gorgeous cover of “Whisper Man”! Now I can’t wait to get my hands on it. Thank you to NetGalley and Publishers Lunch for this digital ARC, in exchange for my honest review! Love reading these...love the excerpts. They always help me to know what I want to read! I love going to NetGalley and discovering that I have been pre approved for many of the books that I want to request anyway. This is always such a great surprise! I have to repeat what I have said before, I love Buzz Books! I thoroughly enjoy reading the samples and deciding which I want to read! Buzz books is a very useful tool that enables me to sample books, so I have a head start in deciding what to order for the library. As always, Buzz Books is chock-a-block full of fantastic reads from valued veterans, newbie debuts, and writers who for one reason or another haven't quite been on my radar. So many gems included in this collection, including a favorite writer of mine, T.C. Boyle. Thank you once again for making BUZZ BOOKS available via NetGalley. I really enjoy these summaries of forthcoming books and recommend them to readers who may not be familiar with this service. They offer an opportunity to quickly see which favorite authors have forthcoming books as well as a chance to learn about some debut titles. Both fiction and non-fiction (new books about Yogi Berra, Barbara Bush, and Sandra Day O’Connor, for example) are included. The Spring/Summer 2019 version contains excerpts from 44 talked about Buzz Books such as THE LAGER QUEEN OF MINNESOTA by J. Ryan Stradal and I am particularly looking forward to reading more of Valerie Jarrett’s memoir called FINDING MY VOICE. Always love  reading about upcoming books. It makes me excited to know what books I have to look forward to reading. DANGER! Your TBR list will grow immensely after you read the previews in this title. I could barely contain my excitement about a preview for J. Ryan Stradal's newest title, and then added practically everything else included in this roundup to my to-read list. I look forward to reading more about Valerie Jarrett's time in the Obama White House, as well as the upcoming Lauren Denton! I look forward to the Buzz Books each season; such a great way of getting a feel for a book and knowing what's coming out. These are always the perfect tools for readers' advisory! AWESOME excerpts from SO many upcoming spring novels that I want to read! Thanks SO much for the sneak peak into all of these fabulous books!!! There are at least 10 books here that I can't wait to read!!! I love this preview of all the books to come. It’s so great getting a little sneak peak of some of the books I’m most excited about. It’s going to be a great year for reading!! I'm no longer working directly with adult purchasing, but these Buzz Books are super helpful talking to patrons at the circulation desk! They give me a quick view of the books many patrons put on hold or want to consider for their book clubs or personal reading. I was happy to find some books I’d like to read and review! Some I have heard of and some I have not. Thanks Netgalley! I loved Buzz Books 2019 Spring/Summer! It provides an excellent list of must read titles coming up. I was particularly happy about the emerging voices and debut authors lists. I also enjoyed reading many of the excerpts that were provided, both fiction and non-fiction. My to be read list has multiplied! This was BRILLIANT!! It lists upcoming new releases and has some great excerpts as well. I’ve already added several to my already large ‘to be read’ pile based on the descriptions/excerpts alone. A great guide that has me excited for this reading year! I’m so glad I stumbled across this! I just requested a few after reading the extended excerpts, and added several more to my TBR list! Great way to know which books to add to my TBR list! Lots to look forward to reading. Thank you Buzz Books and NetGalley. I really like the Buzz Books and it’s exciting when a new one comes out. I keep a list handy and add numerous titles to my TBR. I also really enjoy the excerpts, as they are such a great way to know if you’ll like a book after reading a chapter or so. Thank you for all the work that goes into creating Buzz Books for readers! The Buzz Books always provide plenty of quality recommendations for Net Galley requests and library purchases. Keep 'em coming!!! Thanks so much for getting me psyched for new reads. I discover new authors and see authors whose books I always look forward to reading. Oh my goodness, I think I ended up adding more than half of these to my TBR list. Great to have excerpts! Can’t wait to read these books. I loved getting to see the new books coming out this spring/summer. A few books I hadn't thought much about I added to my list to read! I am especially excited for The Last Time I Lied, Little Darlings, In At the Deep End, Red Birds and The Girl He Used to Know as well as many others. I love that you get to read the excerpts right away so I knew already if I enjoyed the writing style before I committed to the entire book. Can't wait for many of these to be released! I really look forward to these collections! I always find so many great titles to add to my TBR and this collection was no exception. There are excerpts from novels and collections that I know many of us are excited for. This will definitely add to that excitement! If you're overwhelmed by the  publisher's catalogs and want something that will help you focus on the best of the best, then get your hands on a copy of Buzz Books! Some of the stories in this book were really intriguing and I've added them to my TBR. However, the length of this volume meant it was a little tricky to pull out which ones I might be interested in. I think it may have been better if it was subdivided by theme perhaps into separate e-books, roughly the size of the Buzz Books YA volume? What a great preview to some of the upcoming books for this Spring and Summer! I love the inclusion of the excerpts, which are really helpful in deciding which books I want to read and promote. Buzz Books 2019: Spring/Summer was the perfect way to preview and get acquainted with upcoming titles! This is a great tool to use as I plan out my reading year. I particularly enjoyed the debut section as a way to scope out new voices. I love the new cover! And, as always, this collection is filled with tantalising excerpts from some  of the years best upcoming novels - general fiction, debut novels, and non-fiction. And also as always, this was very bad for my to-read list; and I loved it. This collection of excerpts is such a great way to get a sneak peak of your anticipated releases for the year. I’m so excited to read all of these books in full later this year! Another great list of reads from this book. I always look forward to getting a sneak peek at these. Didn't disappoint. There are many excellent titles included here. I have already read a few ARCs and have downloaded a few others. I think everyone will find something they like in this great variety of choices. Buzz Books always provide some nice insights into new upcoming books, which I enjoy (even though for my own good, I probably shouldn't because I already have so much to read. Some very interesting new titles in this latest bunch, looking forward to reading some of them! Buzz Books are always fun to know about. I love to hear about upcoming titles! I've selected a few that I need to read ASAP! What a splendid roundup of previews. Great variety, definite BUZZ. Brings books into my radar that I'd otherwise miss. Especially appreciate the selection of debut authors. From reading other reviews, it looks like this is something that is published on a regular basis, for me however, this is my first experience with this publication and all I can say is WOW!!!!!!!! I'm so thankful to have been one of the lucky people that received a copy. I have added at least 10  of these titles to my TBR list and the best part of all is that Netgalley granted me almost all of the books I requested as Advanced Readers Copies. I've devoured two already! I often peruse Netgalley to see what strikes my fancy and typically I come up with one or two that I request and am approved for, this made it so much easier with links to request right at the end of the summaries of each book. Buzz Books 2019: Spring/Summer is jammed packed with so many awesome titles, I found myself limiting my requests so the publishers didn't think I was a hoarder! So many books, so little time! Get your copy! Wow. what an incredible collection of what to look forward to this coming season. I am so excited about some of these titles. Already planning my TBR in my planner, especially after reading some of those excerpts... Can I request all of them now please? Some that are grabbing my attention are: A nearly normal family, The Girl he used to know, and The Snakes among many many more! Awesome selection of new books to choose from!! There is a little something in here for nearly everyone, with over forty excerpts. I'm so excited about all the great choices, but 'The Guest Book' has me especially intrigued. I feel like a kid in a candy store!! I'm already dreaming of all the great blog posts I can publish this coming spring and summer!! I am looking forward to many of these releases and am grateful for the excerpts to help guide me. This will help me in choosing the books I want to purchase and read in 2019. The publishing world keeps on giving: With 44 excerpts of exciting selections and an incredible list of forthcoming spring and summer titles, no wonder our TBR lists keep growing! As a blogger, this Buzz Sampler is very helpful. Our literary eyes are bigger than what we can possibly read timed to publication, so I’ve whittled down my TBR list to some historical fiction (my favorite genre) by authors known and debuting, and a few memoirs of interest guided by evidence or expectation these will be beautifully written (my blog’s overarching priority.) Dominic Smith’s writing is gorgeous so I’m most excited to read The Electric Hotel. Other historical fiction titles: Sarah Blake’s The Guest Book, Elizabeth Gilbert’s City of Girls, Rachel Barenbaum’s debut, A Bend on the Stars, Fiona Davis’ The Chelsea Girls, Sally Rooney’s Normal People, Jennifer Weiner’s Mrs. Everything, and Daisy Jones and the Six by Taylor Jenkins Reid. Memoirs: Lori Gottlieb’s Maybe You Should Talk to Someone from a therapist’s point-of-view, Myla Goldberg’s Feast Your Eyes about a photographer, and Jill Biden’s voice. Honestly, wish I had copies of all of them! Really enjoyed this group of excerpts. Especially appreciate the debut author sections in these compilations. Now I am ready with my reading list for summer! Thank you for publishing Book Buzz! This is my first time reading a Buzz Books list and I absolutely loved it! It was so exciting to read through and brows the excerpts of upcoming books. I added so many to my list of books to read and noted publication dates so I wouldn't miss them. I'll be looking forward to future seasonal lists. It helps me organize my future reads and gives me so many wonderful new books to look forward to! Great release of upcoming books. Very Informative. Easy to look through. Gave me a few ideas on new books I want to read. Very excited to get my hands on some of these! Every time I get this collection, I'm just adding to my already incredibly long TBR list, and trust me! I don't mind it one bit! This is an awesome collection of upcoming releases! The previews definitely helped peak my interest in a bunch of the upcoming releases. Lets just say that I am definitely adding a lot of these books onto my TBR. I can't appreciate enough being able to see what's coming out in future months. Gives me a chance to pre-order or request from my library. I've found a few gems already in this issue. Once again, I absolutely loved being able to get a mini synopsis and an expert of books to come. To give me a better idea of what to add to my to read list. Many times a book can have a great synopsis but when you purchase the book you realize you don’t mix well with the writing style. This allows me to introduce myself to their writing and see if it’s worth spending my time and money. I am excited for plenty of books and I am very happy to have this as a reference. As always, this catalog of upcoming titles is a godsend for reviewers. Thank you for the time and effort put into this handy reference guide for new literature. Buzz Books is a great way to get a glimpse at upcoming releases. I have yet to not find at least 6  books to add to my TBR list. If you aren't familiar with these books, each one provides highlights and excerpts from fiction and nonfiction books that are being released. Many have a link to NetGalley so you can request those that have piqued your interest( or preorder or put on hold at the library or add to your Want to Read shelf). After finishing the Spring/Summer 2019 edition, I am most excited for Roar by Cecelia Ahern, Bunny by Mona Awad, The Last Time I Saw You by Liv Constantine, A Nearly Normal Family by M.T. Edvardsson, The Whisper Man by Alex North, and Ellie and the Harpmaker by Haze Prior( actually, there are more but I figured I should stop at 6). I have always found new authors through Buzz Books that I might otherwise have missed. Thanks to Publishers Lunch for all the effort putting these guides together for all of us book lovers! This is available at bn.com and amazon.com. It is a fantastic compilation of forthcoming titles. There are also excerpts from a number of upcoming releases. I always love Buzz Books because there is such a wealth of information that is well organized and easily accessible. So many awesome books to preview! There's a little bit of everything here! Those I'm most looking forward to reading that have excerpts are  The Girl He Used to Know by Tracey Garvis Graves and The Snakes by Sandie Jones. Others noted are:  The Better Sister by Alafair Burke, Run Away by Harlan Coben, Life and Other Inconveniences by Kristan Higgins, Summer of '69 by Elin Hilderbrand, Daisy Jones and the Six by Taylor Jenkins Reid (I CAN'T WAIT FOR THIS ONE!!! ), and Lock Every Door by Riley Sager. Absolutely love the opportunity to preview much anticipated titles as well as to see publication schedules in order to plan my own reading and purchases for my school library throughout the year. Thank you to NetGalley and BuuzzBooks (Publishers Lunch) for providing a digital copy in return for an honest, unbiased review. Can't wait for Spring Break! Summer beach trips will be great as well. So many exciting books coming out in the next few months that reading will be a priority. So excited to FINALLY see J. Ryan Stradal coming out with his new book. It's going to be a great mid-2019. I love it when a new Buzz Books issues comes out! Previewing the new books to be published tells me what to request to read on Netgalley and what to look for in the bookstore. I like have lists of all the books coming out and then excerpts of some of the highlight. I have read some of the books already, but I still found quite a few to request from Netgalley. I have some on my shelf ready to be read. It looks like it's going to be a good book season! Thanks to Publishers Lunch BUZZ BOOKS through Netgalley for a copy. As always, I will look forward to the next issue. These Buzz Books excerpts for upcoming books is great for me as a librarian to have an eye on what's coming up. I use this to help make recommendations and to stay informed. It also helps me choose which books I should request for further review on NetGalley. I look for to these buzz book samples all the time. I love to see the newest books coming out so that I can request them or put them on my to be read list. This edition of Spring Summer did not disappoint. There is so many different books coming out and I requested 3 on net galley. The synopsis is given and the small excerpt helps the reader know if they will enjoy the book before requesting it. I find this so helpful in knowing what books are coming and what books I'm going to like. I can't wait to read the young adult version of the  buzz books for Spring and summer. I also cant wait for the next installment of the buzz books. What an incredible opportunity to take a first glimpse at so many of the books-to-watch this year. If you’ve ever wondered how so many people have heard about a new book before it’s even released, this is how! There are a lot of familiar names included in this collection, but quite a few new voices as well. Bunny (Mona Awad), which brings to mind Donna Tartt’s modern classic The Secret History and a personal favorite of mine by Marisha Pessl, Special Topics in Calamity Physics. Doxology (Nell Zink), with a premise primed to spark insight into our modern world, the characters jump off the page immediately and I’m excited to follow them around for a bit. In At The Deep End (Kate Davies), where the narrator is so raw and open that it almost feels like a memoir instead of a character in a Bridget Jones-esque novel, this new voice is certainly promising. Maybe You Should Talk To Someone (Lori Gottlieb), a memoir that opens with candor and humor, Lori (we’re on a first name basis already) is a therapist in need of therapy. Can’t wait to read this in one sitting! Some themes I see – lots of thrillers, lots of narrators unlucky in life and love, quite a few stories set in Chicago! This is a great chance to get a pulse on what’s to come this year. What a great idea! Especially for those of us involved with book groups. I must admit that I haven't had the time to read every excerpt and probably never will but it's a great book to have on hand and one which I would consider buying in a physically printed version as a reference point. Thank you for making such a volume. I’m not sure whether to kick myself because I was so lucky the day I decided to check out Buzz Books or really kick myself because the last thing I need is more books on my “To Read” shelf. This spring’s edition is no different. There are almost 50 upcoming books that are in this edition and they are spectacular. If you are not familiar with Buzz Books they review a selection of books that are going to be released for that season. They are from a variety of publishers and have a selection of different genres. Because the YA genre is so popular they have their own edition. For each book there is a description, information for the book like publishing date, price, etc. and an excerpt. These are not just a couple of wispy pages of a teaser of an excerpt. No, no, no. They include quite a substantial excerpt, enough that you can really get a feel for the text, the voice of the author and whether or not it is your type of book. The problem, if you are someone like me, I get so hooked I want to read the whole book right away!!! They have sifted through the thousands of titles being published and select those that they think are noteworthy or remarkable in some way.The list is broken down into Fiction with subsections of The Notables, Highly Anticipated, Emerging Voices, Debut, and Commercial Fiction. The Nonfiction section include Politics and Current Events, Social Issues, Science and Technology, History and Crime, Essays and Criticism, and Biography and Memoir. Those they have provided an excerpt are marked with an asterisk. There are popular authors with highly anticipated releases like Cecelia Ahern, T.C. Boyle, Nell Zink and Liv Constantine to name just a few. You can discover new authors in the debut section. I was familiar with many of these releases like “Little Darlings” by Melanie Golding and “Naamah” by Sara Blake. Of course the best is that at the end of each excerpt there is link to NetGalley where you can request an ARC of the book. Seriously, this doesn’t help me in my quest for trying to reduce the number of request I make, but I just can’t help it. I’m too excited about the prospect of reading that next great book. There are some really gems that are just waiting to be discovered. Thanks for this. The catalog of buzzworthy books for the spring is super-helpful. I like the way you separate out debut authors from mainstream, and the non-fiction categories are also helpful. Buzz Books for Spring/Summer was very helpful in choosing titles to order for my library. There were several included in there that I would not have chosen otherwise. I look forward to reading them when they arrive at my branch. As always, this is a super helpful resource for readers and reviewers alike. A good selection of excerpts across a variety of genres/subgenres—and the redesign looks great! I faithfully read each edition of Buzz Books to curate the next collection of book launches that I intend to read and review. As the president of a book club and professional writer and book reviewer, I find Buzz Books an invaluable resource to help me focus my attention and invest my time on authors and subjects that will resonate with me, my readers and my book club members. I just finished reading Buzz Books 2019, which is a sample collection of excerpts from upcoming fiction and nonfiction releases for spring/summer (autumn/winter for me). The book starts by listing yet-to-be releases, a lot of which were already on my radar, but I was thrilled to discover that Michael Robotham has a new standalone coming out this year – ‘Good Girl, Bad Girl’, as I really enjoyed ‘The Secrets She Keeps’ last year. I also added to my out-of-control tbr Nora Robert’s – ‘Under Currents' and Michelle Sacks – ‘Moon Daddy' (which I think may have since had a name change to ‘All the Lost Things'?). The excerpts are divided into ‘fiction’ and ‘nonfiction. I'm not big reader of NF so I concentrated on the former. Each book starts with a ‘summary’ followed by ‘sample chapters’. There are 37 fiction (divided into ‘fiction’ and ‘debut'), and 7 nonfiction to choose from, spanning a wide range of genres. My favourite excerpts were Alex Noth – ‘The Whisper Man' (5 sample chapters) and Tracy Garvis Graves – ‘The Girl He Used to Know' (2 sample chapters), and based on what I read I really should just pre-order those two now. I was so sad when the samples ended. I already have e-ARC's from Netgalley for Annie Ward – ‘Beautiful Bad', and Melanie Golding – ‘Little Darlings’, so I didn't read those excerpts, but look forward to reading both in the coming month. Sadie Jones – ‘The Snakes’ (isn't the cover for it gorgeous? ), Liv Constantine – ‘The Last Time I saw You', and M.T. Edvardsson – ‘A Nearly Normal Family’ were intriguing reads as well. Thanks Netgalley and Buzz Books Publishers Lunch for the digital copy. Definitely worth checking out! There's a ‘teen’ version as well which I plan to read. What a treat to get a preview of these exciting books coming our way. Thank you to NetGalley and Publishers Lunch for sharing the buzz! I'm so excited to see familiar names like Elizabeth Gilbert, Joyce Carol Oates, Colson Whitehead, Jo Baker, Liv Constantine, Elin Hilderbrand, Taylor Jenkins Reid, and Riley Sager. I particularly loved reading the excerpt from Liv Constantine's The Last Time I Saw You. 2019 is looking pretty bright! Terrific array of work by talented, interesting writers that I may not have read any other way. I appreciate the breadth, depth, and intelligence that went into compiling this selection--and NetGalley for making the read possible! As a book blogger I love being able to get to read these because not only does it allow me to discover some new and exciting books for myself but I am also able to share them with my readers. This is a fantastic resource. So many hidden little gems within these books. Buzz Books is the best compilation of upcoming books for both fiction and nonfiction. It represents a wide variety of publishers. Lots of great titles coming this spring and summer, especially in the nonfiction arena. Buzz Books is also really helpful for identifying overall trends in the book market. For example, there are a lot of strong female voices in this edition. I love the Buzz Books because it gives me the opportunity to see what the publishing companies are buzzing about and what they project. It is also a wonderful way to learn about those books that are coming out. Think of it as a movie trailer, but for books. What true book worm doesn't love reading about what they are going to read next? Look forward to many more to come! I requested this Spring’s Buzz Books in order to facilitate my work with a book festival. But, as a blogger, I may pick these up in the future to help screen my requests. I really appreciate these books! It helps with ordering and finding titles. I like the excerpts, which helps get a better feel for a book and whether or not I need to order it for my library. I also like the listing of release dates. It helps so much! I love looking through the Buzzbook. It is a good way to find books that you wouldn't normally consider reading. It's nice to consider different genres of books. A real help in deciding which books you will definitely read! I've heard excellent things about the Buzz Books Collection. This is the first time I've viewed one for myself and it definitely lives up to the hype! An outstanding collection of excerpts that will give you a substantial peek at so many upcoming books. I will be requesting the Buzz Books Collection whenever I see one available! Warning: this collection will not help reduce your TBR stack!! Proceed with caution unless you want to add multiple books to your TBR! I've really enjoyed perusing this, and adding more books to be To Be Read list. I appreciate the opportunity to dive into the books further before either requesting them as ARCs, or just putting them on my Hold list at the library. Buzz Books 2019 is a list of Adult books that will be released in the Spring and Summer of 2019. There is a separate book for YA titles. The sections break down Fiction books, Debut novels and also Non-Fiction. Beware, this book will be dangerous to your TBR list! You will find a picture of the book cover, a synopsis of the book then a sample of the book to read, and lastly it provides details about the author and release information. Highly recommended for anyone who loves books and wants to be the first to know what they have to look forward to in the upcoming seasons. This compilation was extensive and well designed. I found more than enough books to add to my wish list, and am now anticipating even more upcoming releases as we head into spring. If you're always wondering where to find out about new books, this is a great resource. It is so fun to see what we have to look forward for books on deck to be released in the Spring & Summer of 2019! I am thrilled to be a member of NetGalley who gives us such an excellent sneak peek at upcoming titles of various genres! Excerpts from fiction, fiction debut, and nonfiction genres…and great ones to boot! Lots of great reading to come! Buzz Books are so helpful! It's a great way to get an idea of what some of the hit new titles are going to be, and when they'll be published. As a librarian this helps me make purchasing decisions. I love the Buzz.. it gives me enough insight into titles to hand sell them or search for the ARC and make them my staff picks. This is one of my favorite sales tools! I found this book great for those looking for books to read. The list includes books from all categories. I always love reading these Buzz Books! I found 12 new books that I can't wait to read this spring and summer. This biannual publication introduces the new publications for each season. Most exciting are the 44 excerpts in this edition. These excerpts include known authors as well as new authors, fiction and non-fictions. What is interesting and exciting is the wide variety of themes in the writings. I find  Buzzbooks an indispensable read to make a more informed choice on what I want to read and purchase this coming season. As always, I am very impressed with the incredible selection of fiction, debut, and non-fiction excerpts that Buzz Books offers. This includes 18 debut authors in addition to known authors like Nell Zink. I am looking forward to going through each one and picking my favorites. Thank you to NetGalley and Buzz Books for offering this ARC in exchange for an honest review. A great highlight of the books to look forward this upcoming season. Highly recommend if you are struggling to pick out your next read with its range of highlights you are sure to find something you capture your attention! I love Buzz Books....great previews of books to come; I end up putting almost all on my wishlist! Great way ot recommend books to my very large group as well! When I first discovered Buzz Books I was thrilled to be given insight into the best new books coming out. My problem was that "my eyes were bigger than my stomach". I requested more books than I could read in a reasonable time. So I had to practice moderation -- not reading Buzz Books until I got over 80% reviewed. I love this! What a fantastic way to preview a smattering of upcoming releases. This maybe the single best reason to have signed up for NG! I am really anticipating several of these books. I can't even narrow down the genre because there are books in the fiction category as well as the nonfiction category that appeal to me. I am excited at how many great new reads are coming, some of which I have been approved for early releases on, and others not. Either way, its been a wonderful introduction to the new releases to anticipate. I am always thrilled when the new Buzz Book editions appear. What a great way to sample a huge number of new books (44 to be precise) from various publishers complete with summaries. If, by chance, you haven't scoped this out and your nose is always buried in a book - this is a MUST. Remember though that these are sampler excerpts of forthcoming publications. I received an Advance Review Copy of this book from netgalley. All opinions are my own. Always love these! Great help in finding out what’s new and upcoming for the spring and summer. Not that my TBR list needs any more titles! But it's also helpful to me in curating lists of upcoming new releases for my blog. Thank you NetGalley and all of the publishers /authors for allowing me to read this book for my honest opinion. I found so many books that I have to read. I absolutely love this way of finding my next read. I get to read a few chapters of so many books. I can decide if I like it or not. I was able to make notes about each one. I could easily find my new favorite author and publisher. I am going to do this format again and I recommend this to all of my friends. This saves time in so many ways. This was interesting. There’s plenty of variety in genres for most of everyone. Buzz books gives you just a little taste of a lot of books and with so many authors it gives a reader an opportunity to sift through and try before buying. I found a few that I would not have read had they not been presented to try an excerpt. This is great for a little read before diving in. This is a fabulous support  for readers. I really enjoyed this years group of excerpts. It gives us a glimpse into upcoming titles in a nice comprehensive book. This is such a great way to get a peek at the upcoming books for the season! I love it! My thanks to Netgalley and the Publishers for my copy. This is my honest review. Love these! Getting insight into what books are to come always get me excited for reading, and helps me create a list of what books I want to buy when they come out! This is a useful resource for my collection development work as a librarian and for my book reviewing work. I will return to this document through the summer. Includes useful lists of new books broken down under just a few main headings such as debut, nonfiction, etc. as well as more in-depth descriptions and excerpts of about 45 titles. I always look forward to these Buzz Books. They provide an invaluable preview of the best books coming up soon. Such a great idea to be able to read an extended excerpt. I am always on a quest to find good books to read so its nice to have these types of books to check out all the new books and when they come out. Thanks! Wonderful insight into what will be released over the next few months. Excerpts are helpful for getting an snapshot view of the works to generate interest and justify pre-orders. Added bonus: the links to full ARCs for some titles as well. Looking forward to Valerie Jarrett book. And as always these samplers provide valuable insight to books coming to market and I’ve come to really rely on and look forward to these Buzz samplers. I hope this never stops! I love receiving the buzz books preview for each quarter. I make sure to request them every time they come out. They are not only informative but extremely helpful when choosing what books I want to read and/review in the coming year. This is a treasure trove of new books. It is great to read the excerpts and get a sense of the author’s subject and style. This is a must read for anyone who loves to read. There are many books included in this spring/summer edition that I would like to read. It’s a wonderful source for finding both new authors and the most recent releases of authors who have published multiple times. I like the way it is organized to review your favorite genres in the order you wish. Am so glad to discover this source. I love buzz books because I get so many new ideas of what to read, some of which I would have never considered otherwise. Keep these books coming! These samplers always get me excited for upcoming books. Based on the samples read, I cannot wait to read The Seven or Eight Deaths of Stella Fortuna by Juliet Grames, A Nearly Normal Family by M.T. Edvardsson, and Then it Fell Apart by Moby. I have already started reading Run Away by Harlan Coben. And from the lists of upcoming books I am patiently awaiting The Better Sister by Alafair Burke, Ellie and the Harpmaker by Hazel Prior, Bitcoin Billionaires: A True Story or Genius, Betrayal, and Redemption by Ben Mezrich, and The Five: The Untold Lives of the Women Killed by Jack the Ripper by Hallie Rubenhold. I am also looking forward to returning to some of my favorite summer authors with Sunset Beach by Mary Kay Andrews, The Friends We Keep by Jane Green, and Summer of ’69 by Elin Hilderbrand. I love the Buzz Books releases. It makes it much easier to see what books are coming out, some I've heard of through instagram, but also many that I would not have heard of. Looking forward to adding some of these to my TBR stack. Helpful and informative! Gave me good information about the newest books coming out this year. I'm always on the hunt for new books for my middle school students as well as myself! I loved this very generous sneak peek of so many different genres! It gave me lots of books to add to my already endless TBR pile! As a librarian it is always helpful to see what's coming up in the written world. It's especially helpful to be able to read excerpts from titles our patrons may be interested in. I love this concept. Like a catalogue for old book clubs but with an excerpt included. Also useful for anticipation of any English language Book Expo. Like, Book Con in NY. I so enjoyed Buzz Books Spring/Summer 2019. It’s an invaluable guide to new book releases, many of which I would not have heard about without this helpful guide. A a serious book lover, I look forward to reading Buzz Books with excitement! Such a great resource! I love being able to see a glimpse of what’s to come in the world of books. I can use this as a reference for many things such as TBR and recommendations. It’s just very handy! I like how there is a section for debut authors as well as how it’s divided up into genres. Very easy to use. There are so many fantastic books in this issue of Buzz Books 2019. I love that excerpts are included as well, even though it does make me wish that I was already reading the books listed. Some of my most anticipated reads are: Natalie Tan's Book of Luck and Fortune, The Whisper Man, Ellie and the Harpmaker, and Beautiful Bad. Great job Buzz Books! Buzz Books releases have become nearly indispensable to me when it comes to getting previews of the best new books coming out each season. The excerpts included are excellent peeks inside each included book and it really is a one-stop-shop for the best of new releases. As always, the authoritative go-to source for what's on the horizon. Well-organized and complete up to the date of publication. A welcome and essential resource for the ardent reviewer. Thanks Buzz Books!